It has now been 12 years since I first started my career as a climber and ski mountaineer, pursuing the first discipline much less seriously than the second. 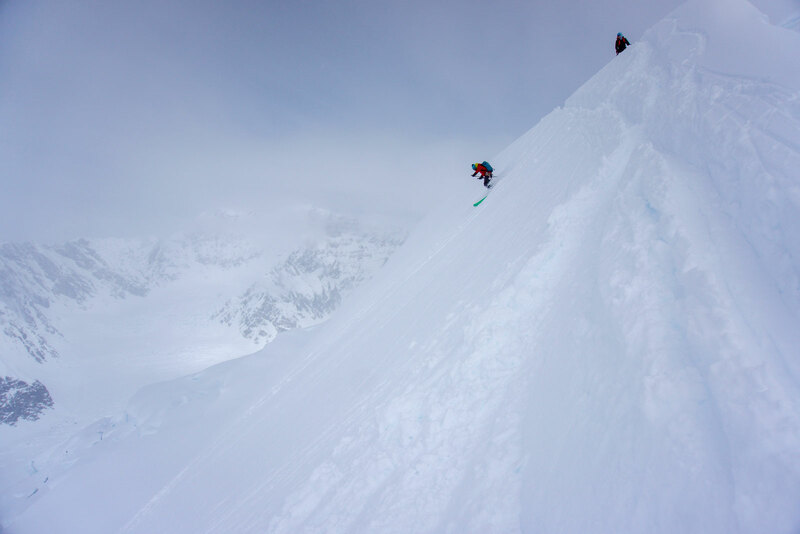 I feel that the idea of completing “open projects” in my skiing life is an uncommon undertaking in comparison to most people who consider themselves climbers. 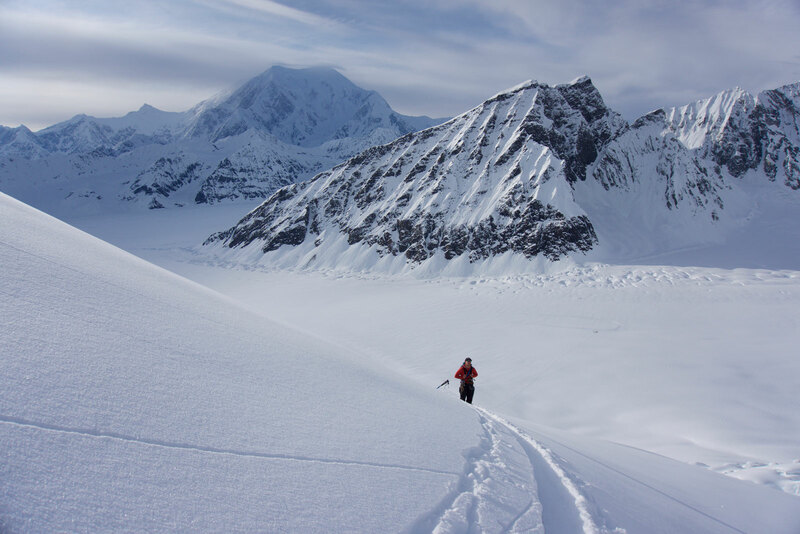 One could argue that ski-mountaineering is a different animal entirely; conditions change year-to-year, or even on a day-to-day basis. The movements are fluid and continually changing for each descent. The difference in mentality could even be that the information available and rules of the game are defined by a less regimented ethos. At least than that of, say, the Boulder Colorado area bolting wars and traditional climbing ethics. Whatever hypothetically could be driving me to have looser defined “projects” in my world of ski-mountaineering, I firmly believe it ultimately comes down to my motivation to maintain a certain level of risk tolerance. 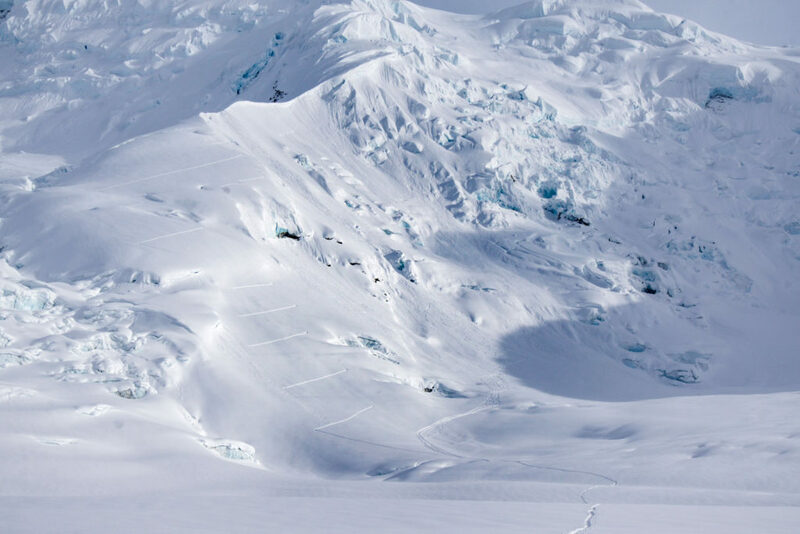 For the most part, I try to tailor my skiing to what the day-to-day conditions are, and navigate around changes such as snow quality, avalanche, crevasse, cornice, or serac hazard. For most of my ski life, I intentionally try to focus myself to the lower 70-90% percentile of the sport. It would seem that top 10% of athletic achievement in ski mountaineering is simply too much for me to rationalize as acceptable risk. I have plenty of ski partners above and below my thresholds of risk tolerance, but I do think this is why the idea of open projects are real and fiery for some ski mountaineers, and completely absent for others. There is an exception to my general lack of open projects. I have one right now: a named yet unskied feature in the Alaska Range that has now drained four weeks of expedition time and thousands of dollars in food and glacier flights. This particular feature is nowhere near the upper 10% of ski mountaineering achievement. However, it is within my risk and exposure tolerance. It’s a reasonable distance from our basecamp, aesthetic, and notable in the greater range’s skyline. I feel that many of these attributes rarely line up for me in Alaska. Now, after my second trip to attempt this peak’s first descent, I am more motivated than ever to complete this project. By no means it is a gimme. Aaron and I made it to within 800’ of the summit on a previous expedition. 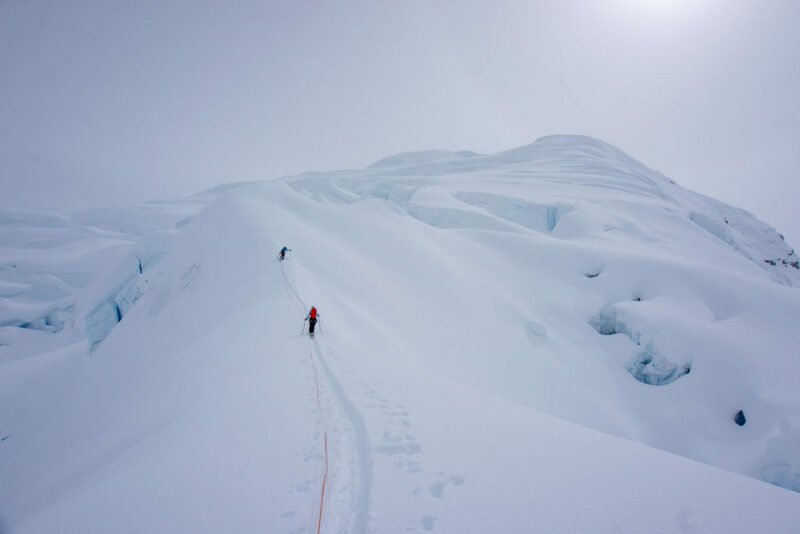 By then it had required expert glacier navigation, AI3 ice climbing, and a close call when another teammate took an un-roped crevasse fall. With 10 days of food and two other teammates joining us, we once again flew to the glacier with hopes of skiing our objective. 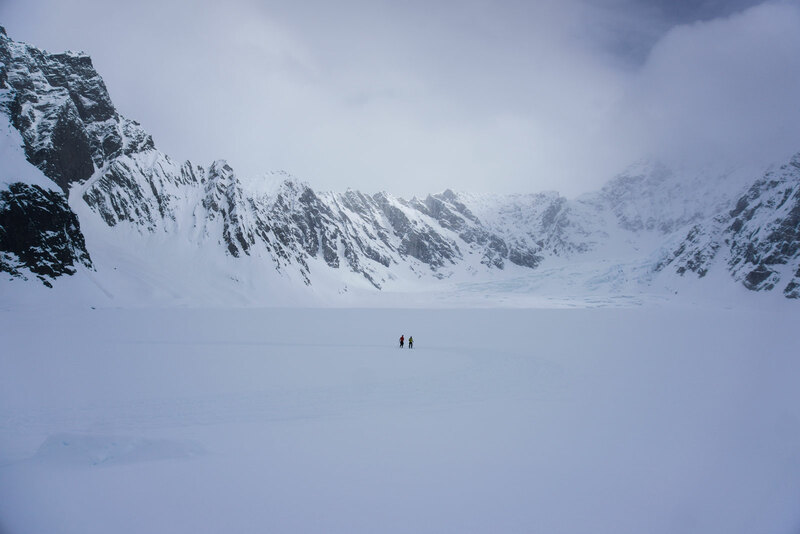 On day four of our 2018 expedition, our first real attempt materialized with marginal weather. We chose to ascend our route from the previous trip, which we already knew was ridden with hidden crevasses and exposed to overhead serac fall. Trying to weigh one hazard over the other, we tried to exit the serac “bowling alley” as early as we could to simply focus on navigating the broken glacier. 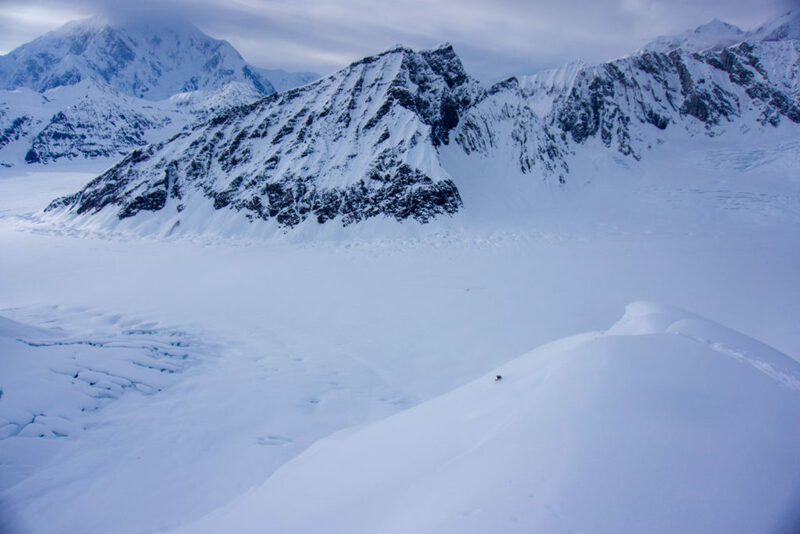 Within just 2,000’ of our basecamp, I heard a muffled yell and then watched the yellow rope snap tight to my harness as Aaron’s head sank below the surface of the snow. I turned my skis perpendicular to the to the rope and was quickly assisted by my other team members to build an anchor and transfer the load to a proper T-slot. Keeping myself on a tight leash, I probed my way to the lip of the crevasse and was greeted by Aaron prussiking himself out of the hole. “What’s taking you guys so long?! 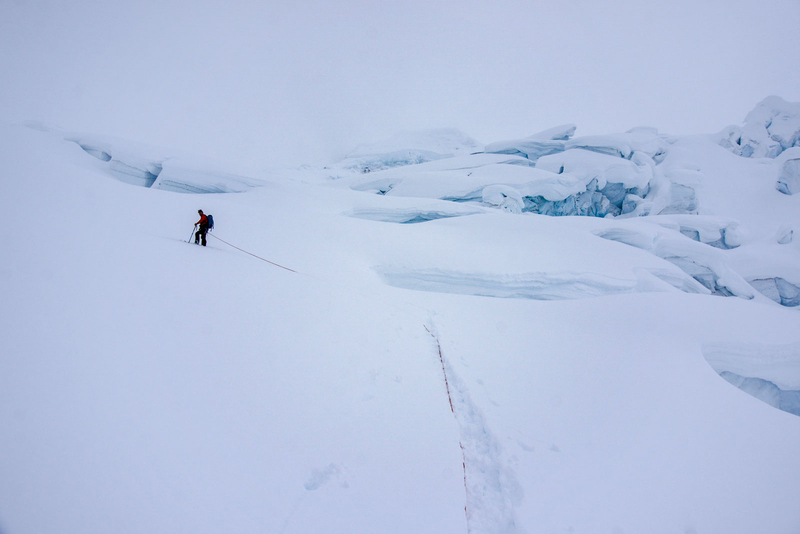 I am almost out,” he declared with an agitated voice as he continually lost ground on his progress because his loaded rope cut further and further into the snow bridge. “Ah geeze,” I replied, now understanding why he was so grumpy with me. I would be upset too, trying to climb out of a dark and bottomless void, blind as a bat, after having lost $1,000 worth of gear. After setting up a new anchor that didn’t parallel the crevasse lip, we pulled him out of the hole and gathered/reorganized our gear. Having my main partner lose his split skis wasn’t that big of a deal. Aaron actually had another setup in basecamp that he brought as a backup. What effectively ended our trip though was the fact that he’d lost his glasses. Before we worried about the productivity of our trip, we faced the reality of getting back to base camp with four people down one pair of glasses and one pair of skis. We ended up putting Aaron on my Dynafit-style NTN bindings/skis roped to Erin, while Adam and I split his 169cm ski setup so that we each had just one ski (and a free heel for myself). 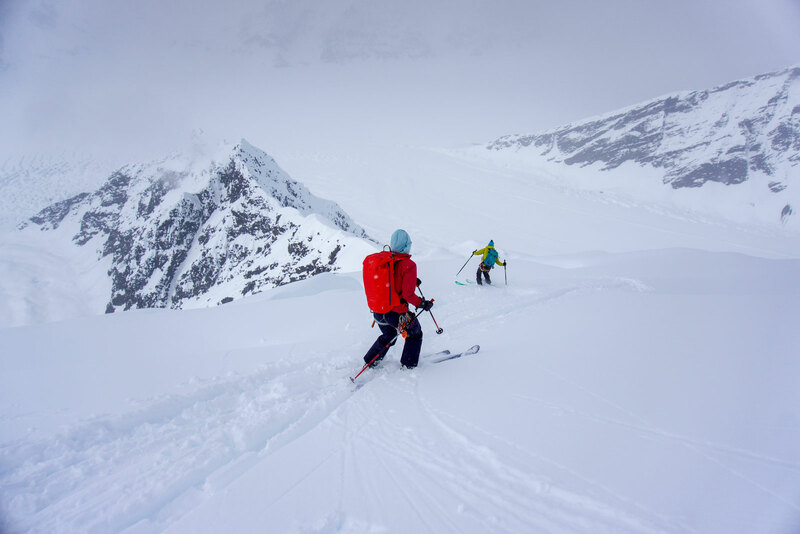 The traveling roped-up circus of four safely groveled our way back to basecamp and spent the rest of the trip exploring and sniffing out the best powder stashes we could find in the ever present flat light. The project remains open, but we will be back next year to try and complete it. 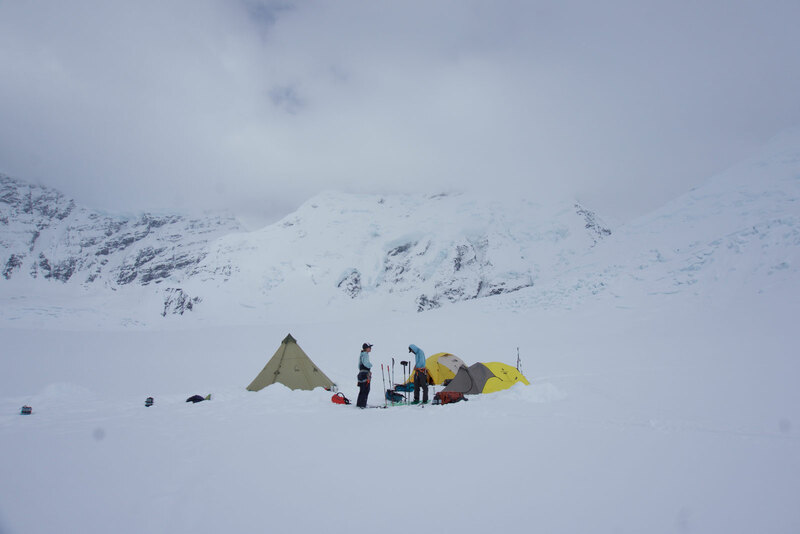 What I learned from this trip is that even though the objective my not be that wild, hard, or demanding, you still need the correct combination of teammates, weather, timeframe, glacier, and snow conditions. In other words: one must be present to win. 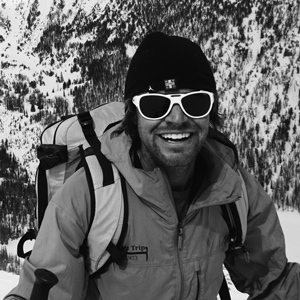 Ty is a career Outdoor Educator, Mountain Guide, and Ski Patroller currently working for Montana Alpine Guides, the Colorado Outward Bound School, Bigsky ski resort, and Porters ski field NZ. 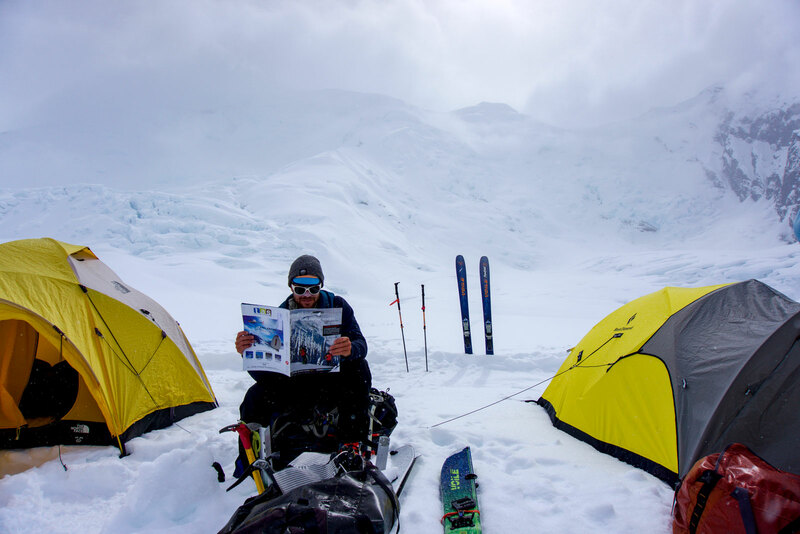 Originally from southern New Hampshire, Ty developed his passion for Backcountry skiing on the eastern flanks of Mt Washington in New Hampshire’s Presidential range. Currently Residing in Bozeman Montana, Ty skis as much as possible in and around the greater Yellowstone ecosystem. 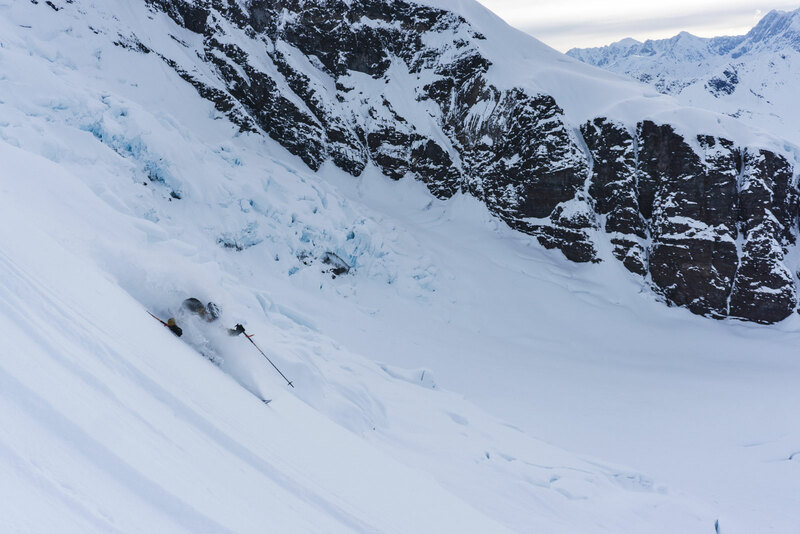 Although Bridger Bowl is his home mountain, Ty likes to explore other skiing venues including Alaska, South America, New Zealand, and New England.